Francisco Ortiz Lopez was born circa 1865 in Mexico, the son of Francisco Lopez and Cresencia Ortiz. He married Cecilia Gaitán Espino, daughter of Esiquio Espino and San Jose Gaitán, circa 1900. They had three children in Mexico, very likely in Sierra Mojada, Coahuila before they were married; they were given Cecilia’s family name Espino (a). After they were married, they had three more children born in Terlingua de Abajo, Texas; they were named Lopez. Note: Family members believe Cecilia’s family name originally was Espino. However, records made after the family came to the United States almost always show the name as Espinosa (or Espinoza). Therefore, to avoid confusion between this report and the official records, I have used Espinosa as the family name. In 1901 Francisco and his family immigrated to the United States and settled in the southwestern part of Terlingua de Abajo in a house built for them the previous year by Cecilia’s father Esiquio. This house is designated TA-29 in the Big Bend National Park inventory of Terlingua de Abajo structures. Francisco farmed in the area, apparently on a fairly large scale, and was involved in the construction of the extensive canal system that was used to irrigate the area. The 1910 and 1920 census records show Francisco’s occupation as “farmer”. 1. Son Juan Espinosa was born April 9, 1894 in Sierra Mojada, Coahuila, Mexico. He immigrated to the United States with the family in 1901 and was living with Francisco in Terlingua de Abajo in 1910. He married Bartola Pardo February 20, 1921 in Terlingua. 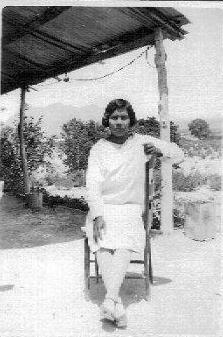 She was born August 24, 1897 in Sierra Mojada, Coahuila, Mexico, the daughter of Pedro Pardo and Angela Espinosa. Father Max Weyert, from St. Agnes Church in Terlingua, led the ceremony and Agapito and Mauricia Martinez were the witnesses. At least through 1929 Juan and his family remained in the Terlingua area, where he worked as a farm laborer. In 1945 Juan was living in Alpine, Texas. He died in Alpine on March 13th, 1947 of acute rheumatic fever. Bartola died in Big Bend Memorial Hospital, Alpine of Uremia December 13, 1974. Both are buried in Holy Angels Cemetery. (1) Son Juan Espinosa was born March 25, 1949 in Brewster County. In January 2000 he was living in Alpine. b. Son Doyle C. Pearce. (3) Son Joenel was living in Alpine in January 2000. B. 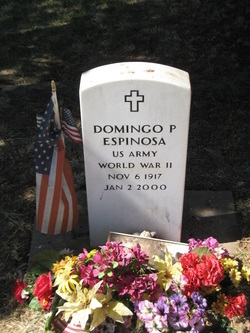 Son Domingo Espinosa was born in Terlingua December 6, 1917. He served with the U.S. Army in World War II. He worked for many years for the railroad. He died at his residence in Alpine January 2, 2000 and is buried in Holy Angels Cemetery. C. Son Viviano Espinosa was born December 2, 1919 in Terlingua. He died in El Paso December 1, 1981 and is buried in Holy Angels Cemetery. D. Daughter Lucy Espinosa was born July 6, 1929 in Texas. From 1945 to 1965 she was a resident of Alpine. She died in Brewster Memorial Hospital, Alpine January 27, 1965 of ventricular fibulation. She married Jose Quintela August 15, 1965 in Brewster County. He was born August 8, 1909 and died November 1, 1976, Both are buried in Holy Angels Cemetery. (1) Daughter Yolanda Chavez. She was deceased by July 2010. Her married name was Molina. 2. Daughter Marcelina Espinosa was born circa 1897 in Mexico. She immigrated to the United States with the family in 1901. She was living with Francisco in Terlingua de Abajo in 1910 but no further information on her has been found. (1) Daughter Juanita Espinosa was born May 6, 1939 in Texas. She died in Western Clinic and Hospital in Midland February 8, 1944 and is buried in Midland. B. Daughter Margarita Espinosa was born June 8, 1921 in Terlingua. 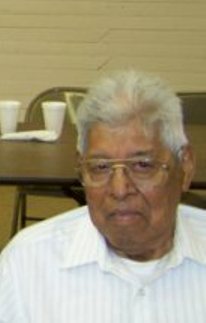 C. Son Octaviano Espinosa was born November 8, 1923 in Terlingua de Abajo. 4. Son Doroteo Lopez was born circa 1901in Terlingua de Abajo. He was still living with Francisco in 1920, when he was working as a general laborer, according to the census. No further information on him has been found. (1) Daughter Estefana Lopez was born November 28, 1944 in Brewster County. Her married name is Martinez. In March 2010 she was living in Fort Stockton. a. Son Michael Lopez was living in Fort Worth, Texas in March 2008.
b. Son Marcus Lopez was living in Irving, Texas in March 2008.
c. Daughter Monica Lopez was living in Odessa in March 2008. (3) Daughter Paula Lopez was living in Fort Stockton in March 2010. Her married name is Dominguez. (4) Son Ernesto Lopez was living in Austin, Texas in March 2010. His wife’s name is Irene. (5) Daughter Delma Lopez married Michael Brennan. In March 2010 they were living in Plano, Texas. (6) Son Reyes “Ray” Lopez was living in Fort Stockton in March 2010. His wife’s name is Margie. 6. Son Juan Espino Lopez was born on March 30 1905 in Terlingua de Abajo. He was baptized in Terlingua, TX by Father Brocardus on September 11, 1905. His godparents were Anteoclo Carrasco and Tomasa Baiza. He married Maria Estrada Huerta, daughter of Ramon Donato Valles Huerta and Silvestra Estrada on March 26, 1924 in Terlingua de Abajo. She was born September 26, 1906 in San Carlos, Chihuahua, Mexico. 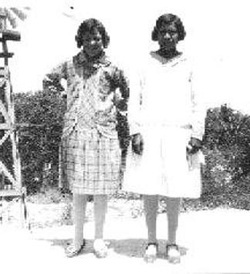 Juan and Maria lived in the Lopez family home in Terlingua de Abajo until 1927, when they moved to Study Butte. One day in 1926 or 1927, while working in the fields in Terlingua de Abajo, Juan was approached by a man who had just crossed the river from Mexico. The man needed a horse but the only thing he had of any value was a 44-40 Colt revolver. He offered the pistol and holster to Juan for a horse and Juan accepted. The gun is still in the possession of the Lopez family. In 1930 he was working as a laborer in the quicksilver mine, and on June 10, 1936 he was working for the Chisos Mining Company, employee number 978. In 1930 Juan received a “Certificate of First-Aid Training, First Aid to the Injured” from the U.S. Department, Bureau of Mines. He died on May 6. 1991 at age 86. Maria died September 26, 1995. Both are buried in Artesia, New Mexico. A. Son Florencio Lopez was born February 23, 1925 in Terlingua de Abajo. He died in Artesia, New Mexico May 27. 1991. He married Seferina Garcia January 9, 1950 in Carlsbad, New Mexico. 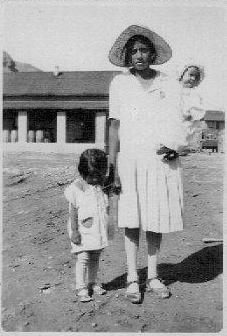 She was born in Shafter, Texas August 26, 1926, the daughter of Juan Garcia and Antonia Hernandez and died 7 May 2010. Florencio served in the U.S. Army. He served a six-month tour in Germany 1946-1947, a six-month tour in Japan 1947-1948 and a six month tour in Korea 1951-1952. He earned the Medal of Honor and the Silver Star for his service. (1) Son Florencio Lopez, Jr. In May 2010 he was living in Artesia, New Mexico. (2) Son Arturo Lopez. In May 2010 he was living in Las Cruces, New Mexico. (5) Son Ricardo Lopez. In May 2010 he was living in Artesia, New Mexico. c. Son Lawrence Albert Lopez. He was deceased by April 2011. (4) Daughter Virginia Herrera. She died a few months after birth. b. Son Hector Lopez. He was deceased by April 2011. E. Son Benigno Lopez was born February 14, 1932 in Four Miles, New Mexico. He died as a child and is buried in the Lakewood, New Mexico Cemetery. Francisco O. Lopez’s first wife, Cecilia, died in 1905 while giving birth to their son Juan. Circa 1907 Francisco married Filomena Mani. She also had been married previously and brought with her two children from her first marriage. They were Marcelino Vasquez and Modesta Vasquez. 1. Son Marcelino Vasquez was born circa 1905. He was still living with Francisco and Filomena in 1930. He was employed as a car operator in the quicksilver mines in 1930 and on 6 Jun 1934 he was working for the Chisos Mining Company. A. Son Ricardo Bonito Hernandez, born April 30, 1931 in Brewster County, TX. B. Daughter Maximina Hernandez, born June 8, 1933 in Brewster County, TX. D. Daughter Maria Hernandez, born August 6, 1937 in Brewster County, TX. A. Son Simon Huerta was born February 18, 1932 in Terlingua and died there March 19, 1934. The cause of death was shown as “probably Diphtheria” (there was no medical attendant). He was buried in Terlingua March 20, 1934. B. Son Cornelio Milan was born September 16, 1930 in Terlingua. C. Son Silverio Milan was born June 20, 1933 in Brewster County. D. Daughter Castila Milan was born March 26, 1936 in Brewster County. E. Son Jose Milan was born April 25, 1939 in Brewster County. 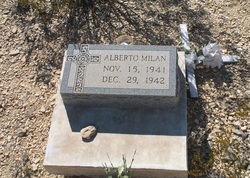 F. Son Alberto Milan was born November 15, 1941 and died December 29, 1942. He is buried in the Terlingua Cemetery. A. Daughter Barbara Lopez married Jesus Rascon. B. 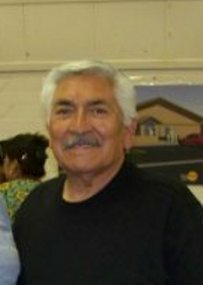 Son Frank Lopez was living in Fort Davis, Texas in 2010. C. Daughter Angie Lopez was living with her father in Carlsbad in 2010. D. Daughter Emma Lopez was living in Farmington, New Mexico in 2010. Her married name is Tafoya. Pascual and Rita took in baby Anita after her mother, Pascual's sister, died. Anita was raised as their own daughter. She married Rita's brother Florencio Najar. Anita was deceased by June 2008. (a) In records on this family, the family name frequently is shown as Espinosa or Espinoza. (b) Recorded in the records of St. Agnes Catholic Church in Terlingua, but the site of the event was not given.